Myfanwy joined the firm in 2004. 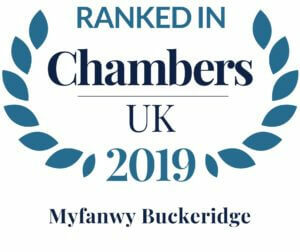 She is a Senior Associate and Manager of the Personal Injury and Medical Negligence departments, specialising in serious injury claims, including brain injury, spinal injury and fatal accidents. She has a particular interest in PTSD. Myfanwy is an APIL Litigator and a member of the Law Society’s Personal Injury Accreditation Scheme. She also sits as an Assistant Coroner. Clients value being ‘treated as an individual’ + find Myfanwy Buckeridge to be ‘very professional’ yet shows ‘compassion’.